Let’s face it, many of us now live a more sedentary life style. A disproportionate number of us work in offices, sit at desks all day, locked into the digital world of our PC's and Macs. We have to endure hours sat in meetings. We even spend valuable lunch times in front of a computer screen catching up on work that needs to be completed by the end of the day. Along with a less active work life, and an increase in stress, many of us get home too tired to do the all-important exercise that could improve our health and give us more energy. For those short of time, there are numerous benefits to incorporating exercise into your daily work routine, including: - Increasing the level of endorphins in your brain and raising happiness levels. - Helping to prevent those lulls in the working day when energy levels drop, particularly after lunch. - Boosting performance by making you livelier and ready to take on new challenges. We all know exercise is good for us. The good news is that getting it into your daily routine is pretty easy and something anyone can do. What’s more, it can be a whole lot of fun. 1. Find opportunities to walk Walking is one of the best exercises that you can bring into your daily routine and the great thing is it’s free. There are a number of ways you can increase the amount you walk and therefore improve your overall health. - If you drive to work, then park further away and add a few hundred yards onto your daily routine. - Rather than take the lift, try the stairs once in a while. - Don’t spend your lunch hour staring at a wall in the staff lounge, get yourself out into the fresh air and have a walk round. 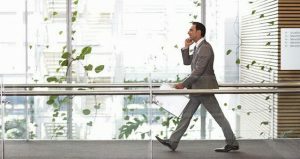 By simply doubling the amount you walk during a working day you can dramatically boost health and improve your level of fitness. In fact, according to some research, regular walking is better for us than jogging and can help to reduce the risk of heart problems. It’s also a great way to reduce the stress we all encounter in our everyday working lives. During a typical day, our concentration rises and falls with each passing moment. A quick walk can refocus your attention and make you much more productive. 2. 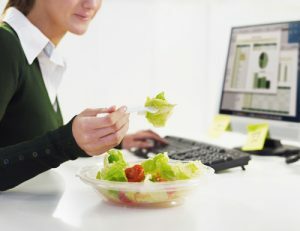 Eat and drink properly Staying fit in the workplace isn’t just about getting enough exercise. What we put into our bodies during the working day is just as important. It starts with having a good, healthy breakfast that gives you a steady release of energy throughout the morning. Snacking on fruit and nuts can also give you an additional boost and having something equally healthy for lunch can ensure you get through the day fully optimized. We all know what is good for us, of course. In reality, it’s a little harder to make sure that we eat the right foods. Those chocolate bars your work colleague brought in look mighty good. And that packet of potato chips would be just the ticket as you wrestle with a difficult work problem. Eating the right foods is all a matter of habit. If you want to change what you consume during the working day then do it gradually. Replace a chocolate biscuit with a healthy, energy giving banana. Rather than crisps try some nuts and dried fruit. Rather than settling for a burger and fries at lunch, which may send you to sleep a little later, try something like a high energy salad with an oily fish like salmon. Not only is food important, what you drink is vital too. Water feeds the brain and raises energy levels. Over 70% of our bodies are made up of water and getting dehydrated can cause a dip in energy levels and reduce performance. Try to avoid excess caffeine and stay away from those sugary drinks if you want to maintain your health and fitness over the working day. 3. Alternatives to the office chair Chairs are good, we all know they are. But how about changing your trusty seat for something a little more energetic. 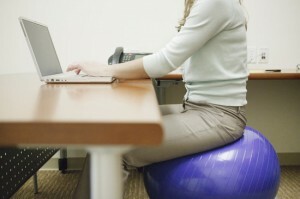 Swapping to alternatives like a yoga ball can make your work day a lot more enjoyable. 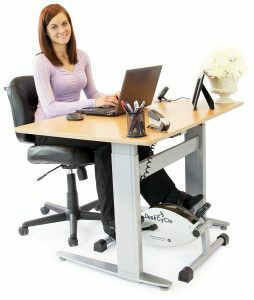 It allows you to exercise whilst sitting at your desk and can dramatically improve fitness without trying very hard. Another good option is to go for a standing desk where you don’t sit down at all. These are specially designed workstations with the level of the desk higher than normal. Having a few standing desks in the office can help raise the energy levels of the workforce. If you work in a call center you don’t have to spend your day locked into that chair. Getting up not only frees your body, it also frees your mind. You can do exercises during the day including presses against the desktop or squats to get the blood flowing. In fact, there are no end of exercises you can do whilst answering that next call. 4. Get a mini-cycle workout If you like your gadgets then there are plenty on the market nowadays to get your muscles working. The mini-cycle was invented initially for medical use to get heart attack patients healthier without having to leave a chair. It’s a great little device to fit under the desk and allows you to work those leg muscles whilst getting on with your job. You can now also get gym chairs that have various tension ropes that you can pull on to work your arms and shoulders. If you have the money to spend you can even get a workstation treadmill. And, if you don’t have a lot to spend, you can always work out on the cheap – that full water bottle weighs a couple of pounds, ideal for a few shoulder presses. 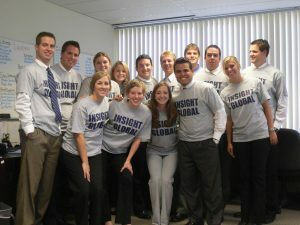 With a little imagination you can find all manner of ways to stay fit at work. 5. Group exercise is fun We often treat daily exercise as a solitary activity unless we are taking part in a sport. Getting the whole office involved in a fitness regime can not only improve everyone’s health but also promote better relations between staff and superpower morale. This can include a set time for an exercise regime such as lunch classes or a game in the office where each staff member in turn has to do a quick set of exercises. Setting up areas where people can undertake a quick and easy period of activity, such as installing a punch bag or cycle machine, can be a cheap and effective way to keep everyone engaged and at peak performance. Exercise is good for us. Incorporating it into a daily work routine is easy and it doesn’t have to cost that much. You might like going to the gym and working out on those hi tech machines in the evening, but you can also keep your energy levels up by simple changes to your time in the work place. Not only will it improve your performance but it will also keep you fit for years to come.